What will be done in the program "From Reus to Hellas"? From the young Cámara de Reus, a program will be carried out in collaboration with the Young Chamber of Greece. This program will be based on sending a team of 12 rescuers who are repaired and equipped to carry out humanitarian and rescue tasks on the sketch beaches, where Syrian refugees arrive, and refugee camps where work goes beyond NGOs and emergency services Greeks For 15 days, they will live on the island of Lesbos where we will coexist with the Greek authorities and rescue teams, 24 hours a day 7 days a week. 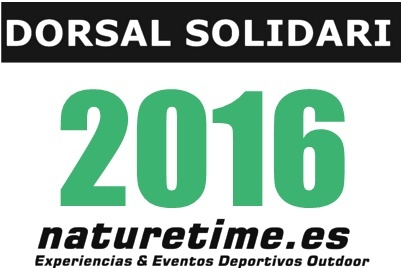 Solidary Bib is an initiative of Naturetime for all its competitions, that enables donations by the participants for a charitable project when they submit the inscription in a race. This year the benefits go to FECEP. La Federació Catalana d’entitats contra el càncer (FECEC, junts contra el càncer) is a non-profit organization that brings together the main organizations working to improve the quality of life of cancer patients and their families in Catalonia. It was founded in 2001 and gives information, helps federated entities against cancer and encourages volunteerism in oncology. Besides, it developes programs in the areas of prevention, survivors and psychosocial research. For the 2015 season, the collected benefits in Solidary Bib 2015 will be destinated to Ocularis project. Ocularis is a non-profit organization that focuses on ophtalmic and optic training in developing countries in sub-Saharan Africa. Its task is to train eyecare professionals in their countries of origin, with their own tools and their own illnesses. Its aim is to achieve equal and universal access to eye health, improve the quality of life of people and contribute to poverty eradication. Solidary Bib 2014 was destinated to Astafanias project. Astafanias is an association of families from Tarragonès, founded in 1966, that encompasses all mental disabilities, such as TEA, Fragile X syndrome or ADHD. It is a non-profit organization that aims to provide guidance, advice and support to families who need it against various problems that may arise with this type of disability. Solidary Bib 2013 was destinated to Metaloproteinasas, project that belonged to Grupo de Oncología de la Asociación Española de Gastroenterología (AEG) (www.aegastro.es). Money was allocated to the doctors responsible for the investigation of pancreatic cancer, colon and liver.